A mysterious supernatural entity has taken up residence in the Cash4Toners warehouse, presumably sell us unused toner…better check the expiration date on that! 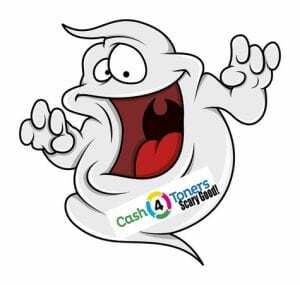 Cash4Toners shipping-and-receiving clerk Trevon Keith claims supernatural spirits have moved into the Cash4Toners warehouse, causing mayhem and disarray. “I don’t know if it’s because of Halloween approaching, or that giant hellmouth we found behind that old box of toners, but things are decidedly strange around here,“ Keith said. Cash4Toners CEO Joe Chavez says he spent the night in the warehouse and, aside from a few overturned recycled toner cartridges, saw nothing out of the ordinary. “Free ground shipping is always a huge draw for us,“ Joe said, before levitating approximately three feet off the warehouse floor and speaking in an ancient tongue. Shipping-and-receiving clerk Macy Waters found the warehouse haunting in general, and Joe Chavez’s comments in particular, profoundly disturbing. Waters was referred to Cash4Toners Human Resource director Andrea Carey who chastised Macy for being “age-ist” and enrolled her in our re-education program atop the warehouse roof. “I get so rundown this time of day,” Andrea said, sliding into a hot bath of cyan ink.